What's your opinion on laugh lines? Personally, I'm not too against them, as I find that they can give a person character and grace - the sophisticated type that can only come with age and experience. And for crow's feet especially, I feel like they can make a smile look much more pronounced and brighter. However, they say too much is as bad as too little, and deep or severe wrinkles might make you look much older than your actual age. 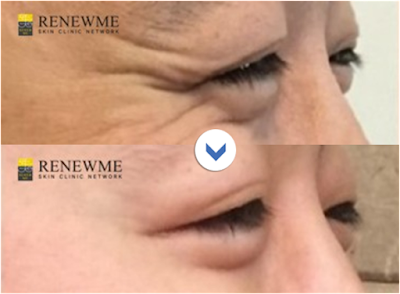 When dynamic wrinkles (wrinkles that are caused by muscle movement - horizontal forehead lines, frown lines, crow's feet) first start to form, they can be prevented early with botox injections. However, the longer you leave them, the deeper they get, and eventually the wrinkles can become scar-like and stay permanently even when you're not making any facial expressions - at this point, not even botox can help. The skin starts to lose its moisture and form wrinkles normally starting from your thirties or forties; this is the optimal time for you to start botox injections. Keep in mind that even the most expensive eye creams cannot erase the wrinkles that form when you laugh. As you can see, this patient (male in his thirties) looks at least ten years younger without the crow's feet! If you look closely, he still has some fine lines around the corners when he smiles; this is because botox should be done naturally and just enough to prevent the severe wrinkles. Otherwise, your expression might look frozen and quite strange until the effects wear off. Gosh, even his skin looks much healthier with all the lines gone!